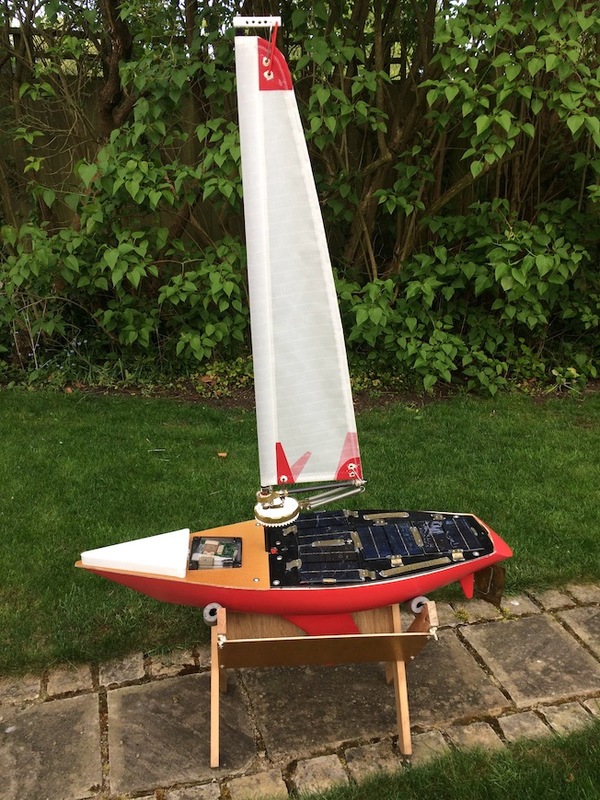 This is the boat without Solar Panels fitted yet. It has the smaller rudder as used on the maiden voyage, although this has now been enlarged down to the bottom of the skeg, and about twice as wide. Hopefully this will be large enough. The boat is about 0.9m long. This is the boat as on 8th March 2016. 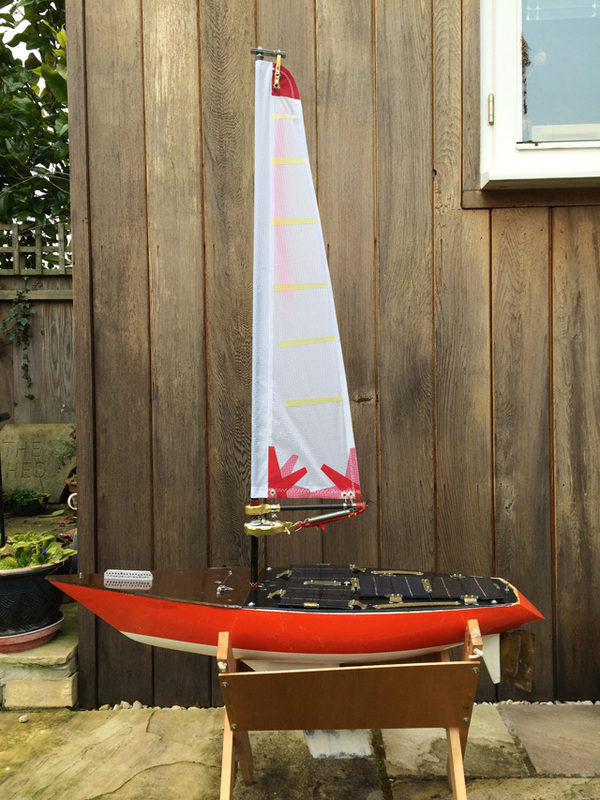 It now only has one sail (ie no jib). This allows the mainsail to swing all the way round the mast. It also has the eccentric bearing and spring centring mechanism. (See below for details.) The rudder now much small than in the picture above, but rather difficult to see. It is now as deep as the skeg, and reaches to the stern (it is not on the centre-line in this photo so appears shorter). This photo shows how the boat as launched in 2017. The sail is made of stronger material. The front electronics box (containing the GPS and RockBlock) has been raised above the front deck: this is to reduce the liklihood of the aerials being blanked off by sea-water covering it. (Only a few mm is needed to screen off the GPS signals.) The solar panels are now encased between glass and a brass sheet to water-proof them, and they are mounted in a new layer of expanded- poly-styrene for protection, and to give more bouyancy for the boat. 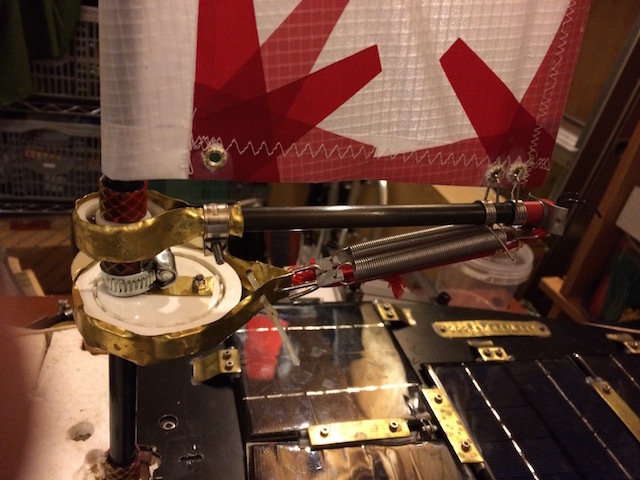 This photo shows how the boom for the single sail works. The boom itself is the horizontal carbon fibre tube. The clew of the sail ("clew" is the corner not attached to the mast) is fixed to the end of the boom furthest from the mast. 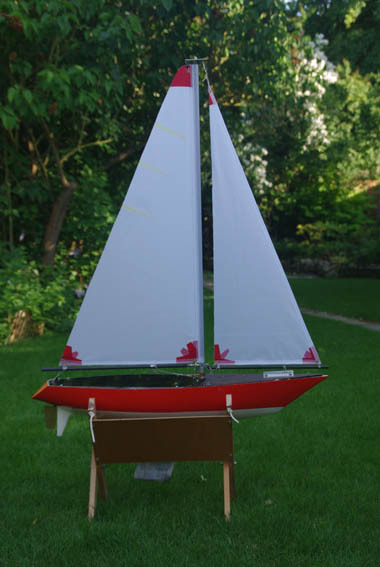 (The sail is white ripstop nylon with red reinforcing.) The boom and sail can rotate 360 degrees around the mast (there is no jib). The boom bearing can just be seen inside the brass ring that mounts the boom. Below the boom going diagonally down from the clew end of the boom are two springs, attached to another brass ring, holding the eccentric bearing (the big white round thing). This bearing was 3D printed by me at home, using a RepRap FDM printer. The inner race of the bearing is fixed to the mast, but it is not concentric to the mast. The centre of the bearing is actually about 15mm towards the stern of the boat. This means that as the boom swings around the mast towards the bow, the springs are extended. The springs therefore try to pull the boom back to the centre line of the hull. So if the wind is sideways on to the hull, it will try to blow the sail around the mast, towards a position on the other side of the hull away from the wind, but this is resisted by the springs. If the springs are the correct strength, the sail will move to an angle where there is a good thrust from the wind, but not too much heeling force. If there is a gust, the sail can open out a bit, meaning the boat does not heel over too much. This all takes some experimentation to get right and is a compromise between getting good thrust from the sail (lift) without too much heeling force (drag).